Musician and composer Noah Goulet, right, has written a piece that will be played Sunday during the Central Ohio Symphony holiday concert at Ohio Wesleyan University. 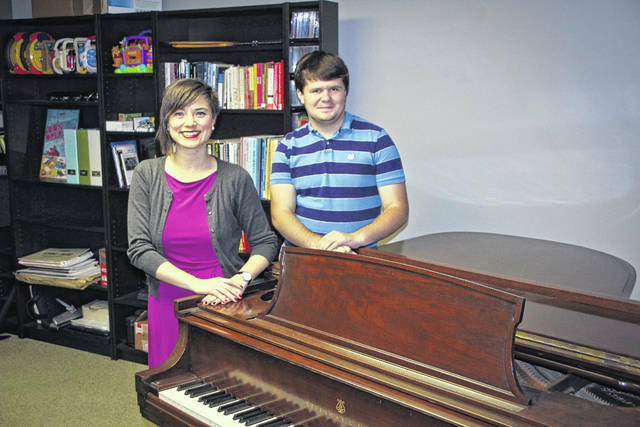 Goulet is shown with his composition teacher Jennifer Jolley, a professor of music at OWU. He’s been Jolley’s student for three years. Two shows are planned for 2 p.m. and 4:30 p.m. Sunday in OWU’s Gray Chapel. For ticket information, go to www.centralohiosymphony.org or call 740-362-1799. Music enthusiasts attending the Central Ohio Symphony’s holiday concerts this Sunday will get to hear the premiere of a piece by a young composer from Delaware County. In addition to its performance with Celtic band Lone Raven, the Symphony will play “Welcome Sun,” an original composition by Hayes High School student Noah Goulet, son of Russ and Nancy Goulet. It marks the first time that one of Goulet’s pieces — he’s written 30 so far — will be played by a professional orchestra. Two shows will be presented at 2 p.m. and 4:30 p.m. on Sunday in Gray Chapel at Ohio Wesleyan University. The idea for “Welcome Sun,” Goulet said, was inspired by the winter solstice, which is Dec. 21. For the past three years, Goulet has studied music composition with Ohio Wesleyan University music professor Jennifer Jolley. The professor is equally excited about the debut of her student’s piece this weekend. To this point, Goulet and Jolley have only heard ”Welcome Sun” played by a computer program. Goulet’s musical career began when he was in seventh grade and he picked up the clarinet. However, he knew he wanted to do more than just play an instrument. “I got into composition really just by listening to good music, and I decided that I wanted to be able to do it, too,” said Goulet. He’s a member of the symphonic band and marching band at Hayes and also played in the jazz band last school year. Goulet said despite getting a relatively late start on his musical journey, he’s developed quickly. Jolley said it’s a joy to work with Goulet. Tickets for the concerts are available at the Symphony Source office, 24 E. Winter Street, Delaware. Prices are $25, adults; $20, seniors; $6, students of any age; and $4, children, age 6 and under. Tickets may also be ordered online at www.centralohiosymphony.org or by calling the Symphony at 740-362-1799.